Place baking sheet upside down in oven and preheat to 400 degrees. Beat lemon zest, eggs, and parsley in a bowl. Pour half of the egg mixture in medium bowl and stir in mozzarella. Reserve remaining egg mixture for brushing on the crust. Turn another baking sheet upside down and line it with parchment paper. Brush it with olive oil and unroll the dough on the parchment paper and pat into a 9 by 12 inch rectangle. Spread mozzarella mixture over one half of the dough, leaving a 1 inch border along the edge. Top with the salami followed by the pickled vegetables and provolone. Fold the other half of the dough over to cover the filling. Crimp and roll the edges to seal, then pierce the top of the dough in a few places. 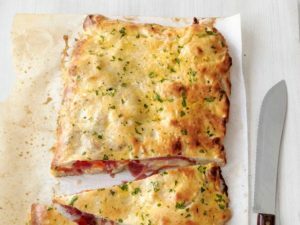 Slice calzone with parchment paper onto hot baking sheet. Remove from the oven and brush with remaining egg mixture, then continue to bake until the crust is golden, 5 to 10 more minutes. Let rest for 5 minutes then cut into wedges.